I feel a certain kinship with today's Raising Readers guest. Ana is a mom of four boys who loves to read. Sound familiar? (wink wink) I found her blog several years ago and felt that instant connection that comes from similar interests and experiences. 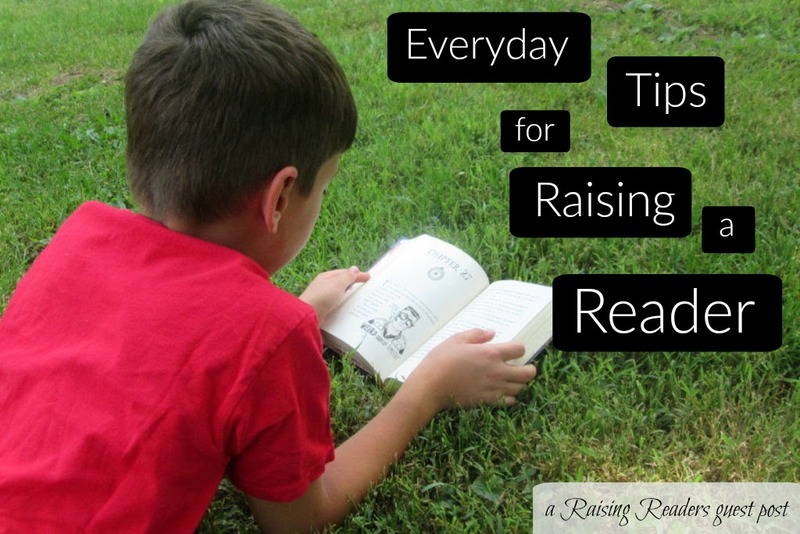 Her boys are a little bit older than mine, and I love her posts about what they're reading (she breaks it down into the 4-6 and 8-12 year range) because I always come away with new ideas for my own kids. I also enjoy the things she shares about the books she's reading herself, personality types (we're both introverts), parenting, and cooking. In this post, she gives a number of easy-to-implement, but instantly rewarding, tips for raising readers. We follow pretty much all of these in our home in one form or another, so I can vouch for them! Please share your own tips in the comments! By reading a book, we learn compassion and empathy by walking alongside a character with a completely different worldview and life experience than our own. We can relive history, or explore fantasy worlds that exist only in the imagination. Reading engages our creativity and imparts wisdom. It connects people across time and space. It allows us to vicariously experience things we would never otherwise be able to. Two of my four boys started life out as preemies in the NICU. The doctors and nurses encouraged us to read to them, so we sat next to their crib, making our way through piles of children's books. Babies love the sound of your voice, and the earlier you can start reading to them, the better. However, I freely admit that this strategy was much more difficult to implement with my last baby. We logged a lot of reading time in the quiet NICU, but once he came home, one-on-one time was scarce, as I also had a houseful of older brothers to contend with. I often play audio books when the boys are busy with Legos, trains, cars, art projects or play dough. (This helps the overall noise level of our house as well, which helps keep me sane). I fight my type A personality's tendency to push pause if one of them leaves the room, or to meticulously note the exact second where we left off at our previous listening session. I think they absorb a lot while the audio book plays, even if it doesn't have their undivided attention. We also use audio books on car trips of 45 minutes or longer. It makes the time pass so much faster, and is great for books that are slightly above their reading level. My oldest son really enjoys listening to books on playaway devices, which he checks out from our library. If you're not familiar with them, a playaway device is about the size of a deck of cards. They're battery operated, and you listen to them with ear buds. They're so small and light, you can take them about anywhere. I have learned to relax and adjust my standards a lot over the course of my parenting journey. I read Farmer Boy to my oldest son when he was three years old, and I expected him to sit quietly and listen attentively for long periods of time. I had this idyllic image of him sitting for hours on end, enraptured with the story, and I was disappointed when that didn't happen. As a bookworm parent, I knew the world was filled with great books, and I just couldn't wait to introduce the boys to my favorites! So I jumped the gun a little. Many classic books have early reader abridged versions for children, and even picture book adaptations for toddlers. These are wonderful ways to introduce characters and story lines to children, and as they grow, they can revisit these familiar friends in more advanced and original editions. One of the most important lessons I've learned when it comes to books and kids is that reading is reading is reading. Often what I want my boys to read doesn't line up with what they're interested in. One of my middle sons didn't begin life as an enthusiastic reader. In my struggle and frustration, I searched for anything he would read, and I struck gold with Star Wars. In my desperation, I brought home bags of Star Wars books home from the library, and they ended up converting him into an eager reader. He now reads well above his grade level in school and reads a (mostly) wide variety of books. I often remind myself that I loved Baby Sitter's Club books as a young teen. Even if your children NEVER read the classic literature you want them to, reading books improves the mind. Period. (Although on the flip side, I also believe in gently encouraging your children to stretch their comfort zone in the reading material they choose). This summer, I came up with my own reading program, which we'll do in addition to our library's summer reading program. My program gives more points for reading books they've never read before, and less points for books about video games. There are also bonus points available for types of books I would like them to read. They're still free to choose what they want, but hopefully the incentive will influence their book choices. We let our boys check out anything (appropriate) they want from the library. I also check out things I hope they'll read, and leave the books around the house in plain sight. It doesn't always work, but it often does, and I don't make a big deal out of it if they don't want to read my choices. I just keep requesting more. When the boys were little, we were regulars at our library's story time. We're really blessed to have a great library system that has lots of quality children's programs and events. Just making the library a familiar, happy place with good memories in it, lays the groundwork for the habit of reading. Libraries are a goldmine of resources for all kinds of interesting learning experiences for children and adults. Our library has classes on making artisan ice cream, growing berries, reading clubs for children and adults, concerts put on by local musicians, and much more. Outside of school, our boys get 30 minutes of screen time of their choosing, for either TV or games/other electronics. Some families probably think that's too harsh, and some probably think it's too lenient, but it works well for our family. As a result, our house watches little TV, which means more time for reading. I also try to always have my boys read the book first, before we watch the movie version. Often, movies are somewhat empty shells of books, and that's even when they're done well. Most books contain way too many details to fit into a hour and a half time frame, so lots of things get cut. By reading the book first, it forces their imaginations to do all the work. Reading has brought so much enjoyment to my own life, I naturally wanted to share that with my children. By instilling the love of reading in a child, you broaden the horizons of their world. For a little while, they can see life through the eyes of a King or Queen, an astronaut, a Roman soldier, a pioneer, an alien or a dog. Summer is a great time to strengthen your child's love of reading, no matter where they're starting from, so visit your library and help them pick out books they're interested in, and read together. Ana lives in an old farmhouse, where she wrangles a pack of boys. When she's not refereeing light saber battles or watching backyard baseball games, she loves to read, garden, craft and cook from scratch. She blogs about it all at Lessons From Yesterday. Thanks for all these great tips, Ana! I'm totally impressed that you're doing your own summer reading program.